Having been a big fan of Syfy’s first “re-conceived” fairy tale miniseries, Tin Man, and having greatly admired their second, Alice, I had been anticipating their Peter Pan prequel, Neverland for quite a while. 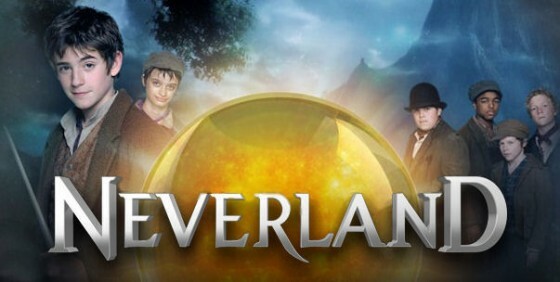 Though written and directed by Nick Willing, the same man who directed the former, and wrote and directed the latter, Neverland seemed as it would be rather different. Whereas the first two were modern-day-set, punkish spins on the classic children’s tales from which they originally sprang–L. Frank Baum’s The Wonderful Wizard of Oz and Lewis Carroll’s Alice in Wonderland, respectively–Neverland is a period piece that claims to tell the previously untold story of how a young boy named Peter became the boy who would never grow up and how his epic struggles against his pirate archnemesis, Captain Hook, began. The first two reveled in creating new, darker worlds far removed from their source material. Neverland, on the other hand, seeks to capture a similar form of storybook magic, in order to set the stage for J. M. Barrie’s beloved tale. And what I found perhaps most interesting about Willing’s twist on Peter is that it isn’t a straightforward prequel. Although its tone is much more in keeping with the story I grew up with than either Tin Man or Alice, it makes a number of significant plot deviations from it, as well, creating just as much of an alternative version as his previous fairy tales. For one, the backstory presented here, in which Peter begins as a Dickensian street urchin and petty thief working in a gang of kids run by an adult Fagin-like figure, James Hook, who will eventually become the pirate captain of myth, conflicts with the original tale in which, as a baby, Peter becomes lost and winds up in Neverland and then later returns to his house only to find his parents have replaced him with a new baby. Secondly, the “present day” of the tale is set in 1901, and given that Barrie’s play was originally performed in 1904, that would mean that Peter would only have been Peter Pan for three years before meeting Wendy, unless (and this seems more likely) that occurs later in the timeline of this alternate tale. Thirdly, in this story, Neverland isn’t a magical world located in a completely different dimension but rather a planet that can be reached not by flight but through the use of a portal produced by a strange, alchemical orb. In other words, Neverland attempts to craft more logically and metaphysically coherent and, in some cases, pseudo-scientific explanations for how the tale of Peter Pan as we know it came to be. And if I considered this to be a definitive prequel, I might have trouble embracing it wholeheartedly, simply because for me, a great deal of the childlike wonder and awe of Peter Pan is in not knowing exactly how lost boys magically wind up in Neverland or how Hook became evil, and also in believing that, powered by fairy dust and happy thoughts, a bunch of children could fly over the rooftops of London and into an enchanted world that defies reason or explanation. When viewed as an imaginative reinterpretation meant to complement and pay homage to rather than supplant the original, however, I find Neverland quite dazzling in its own right, for a variety of reasons. To begin with, it does dabble in a bit of alchemy and interplanetary travel, yet it manages to never over-science itself into oblivion. Instead, it takes a page from Doctor Who, one of the few other science-fiction productions I can think of that can provide pseudo-sciencey explanations to otherwise seemingly magical occurrences without robbing them of their magic. 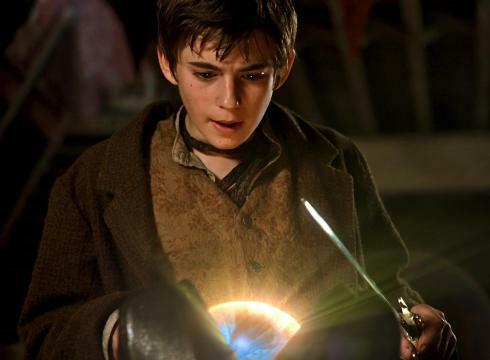 Just because we know an orb produced by “science” facilitates the trips back and forth from Neverland doesn’t mean we ever learn how the orb works, nor do we learn how it falls out of the hands of the scientists who created it –it is still a magical McGuffin. I actually found the orb and Neverland’s back story quite good fun. And just because Neverland is located on another planet rather than an entirely different plane doesn’t mean that it doesn’t have genuine magic in the form of fairies–here called “tree spirits”–and fairy dust, which may be referred to as “mineral dust” instead but which has the same effect of allowing people and objects to achieve flight, in a manner that is just as mysterious and ungraspable by any intellectual definition as in the original, nor that it doesn’t have creatures just as strange as those in Barrie’s book. I particularly like this production’s portrayal of the crocodiles as enormous creatures with ten legs, the breathtakingly icy landscape in which Peter and the boys first arrive, and the androgynous depiction of the fairies. I also really like how Willing has fleshed out Peter and Hook’s relationship, thanks to a few key revelations unveiled as the miniseries progresses, which intelligently unlock character motivations that drive Hook in his arc from Peter’s caretaker to his greatest enemy. And the first reveal actually seems to be indicating a plot point that has become quite cliche over the past thirty years, until it twists again into something even more surprising and clever. Additionally, it just seems to make emotional sense not only that the two were once close but that they were involved in criminal activities together. Peter’s pickpocketing past lends itself to the free-spirited, amoral creature of carefree, mostly conscience-free abandon that he will become, whereas Hook’s thievery makes his progression to pirate quite natural, indeed, not to mention indicative of the truth that, when push comes to shove, despite his seeming initial fondness for the boys, he is Not a Very Nice Person. As Hook, Rhys Ifans does a stupendous job, expertly navigating each emotional twist and turn of an arc that, in less capable hands, could have come across as being motivationally muddled. He makes you believe Hook as a legitimate person–passions, madness, and all. 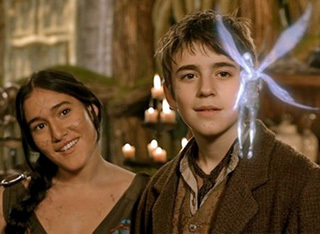 Neverland has an equally excellent Peter in Charlie Rowe. It is actually quite a demanding role, as Neverland doesn’t sugarcoat the hard life this young boy has had, growing up on the grimy streets. His evolution from street-smart thief to joyful adventurer is gradual and commendably subtle. He is never either too sweet nor too hard to be a likable hero. Overall, the manner in which the production presents the harshness of the boys’ lives is extremely impressive. These boys aren’t instantly enchanted by Neverland. Their realization of how wondrous it is does not come instantly, which almost makes the production more magical, as we witness these hard-bitten young people begin to experience the childhoods they hadn’t had up to that point. Peter’s gradually developing friendship with Tinkerbell is particularly lovely. And for those Americans who have only seen Anna Friel in Pushing Daisies, this miniseries also provides an excellent opportunity to see her in an extremely different role–as a scenery-gnashing, evil witch of a pirate queen. She seems to be having a ball in the role, lighting up the screen with wickedness in each of her scenes. The production also deserves a great deal of credit for its depiction of its Native American characters. Ever since Western culture has become more sensitive to issues of ethnicity and race, the general depiction of the “Indians” in older versions of the Peter Pan tale can often be seen as problematic at best, dangerously ignorant at worst. Neverland, however, as far as I can tell, doesn’t seem to have any of these issues. The Native American characters are strong characters in their own right, with human drives and motivations. They aren’t broadly drawn stereotypes of the Noble Savage, nor caricatured cartoons beating drums, saying “ugg-a-wugg” and mangling grammar, as they are in the Disney film. Neverland develops them intelligently, organically dramatizing both their initial friendship with the boys as well as their eventual break from each other, while never making them any less than completely reasonable, rational people. It is also exceedingly rare to see Native American actors and characters on film, and Neverland treats them with dignity and respect, but also without kid gloves. They aren’t depicted as being flawless or always right, but just as people. The beautiful Q’orianka Kilcher makes Aaya (more commonly known as Tiger Lily) into a strong character in her own right, not the simple victim of the original. Willing also does a lovely job of connecting Native American culture and mythology to Neverland. They give the place its name and treat its natural elements, such as the tree spirits (which they have named thusly), with respect that the pirates spit upon, in their quest for power. In so doing, Neverland depicts a parallel between the pirates and the European settlers of America, but without leaving the viewer with the feeling that he or she has been hit across the head with a sledgehammer. Neverland isn’t a perfect production. It has some pacing problems, particularly in the final hour or so, as well as a few plot points that aren’t developed as well as they could have been. There is also quite a wide divergence in quality between various special effects. Some look quite excellent indeed, whereas others look extremely fake. Interestingly enough, it is often the “real-world” elements that are more problematic. The magical elements have the liberty to look a little unreal, in my opinion–after all, it’s a fairy tale, and as with Once Upon a Time, I feel that it adds a certain added level of fantasy to the proceedings–but when an avalanche occurs and the rocks look as if they haven’t been fully rendered, it really sticks out like a sore thumb. Overall, however, Neverland is a fantastic Peter Pan story (albeit, again, not the best version; for that, I would point you towards the 2003 film with Jason Isaacs and Jeremy Sumpter) that evokes the magic of childhood and the cozy feel of curling up with a storybook on a cold, wintry night. This review first appeared, in slightly altered form, on Rob Will Review. What do the Natives call Neverland in their languagr?